Perineural invasion is defined as malignant glands circumferentially enclosing or surrounding a nerve. It is seen in approximately 20% of prostate needle biopsies with cancer. Benign glands may occasionally show perineural indentation. 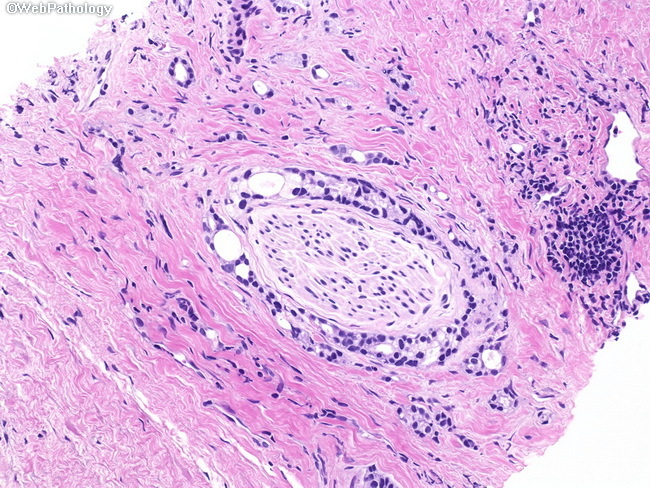 Perineural invasion represents one of the major routes for the egress of the cancer from prostate to involve periprostatic soft tissues and other structures. Some studies have shown that perineural invasion is a predictor of extra-prostatic extension of the tumor in multivariate analysis; however, this is controversial.